As the global economy transforms into a world of digital services that cross industries, including those that provide value-added services for physical products, managing the complications that arise from digital browsing, selection and purchasing of goods, as well as activation, billing and servicing of accounts, becomes a challenge. Organizations have to not just engage customers but provide satisfying experiences that keep them coming back. 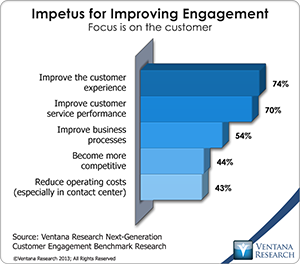 Our benchmark research on next-generation customer engagement shows that improving the customer experience is the most widespread impetus to improve engagement, for almost three-quarters (74%) of organizations. Few however have established business processes and applications that support these efforts, which today involve marketing, sales, customer service, operations and accounting departments. We also find that some of the largest suppliers of cloud computing software provide the worst experiences when it comes to billing for and changing existing subscriptions. 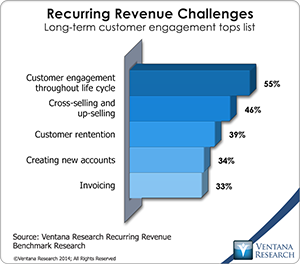 Ventana Research tracks these dramatic changes in how business is conducted. I have written analyst perspectives on digital transformation in business overall and specifically in sales and commerce and marketing. My colleague Richard Snow has commented on customer engagement, and Robert Kugel has discussed finance. Organizations that do not take these challenges seriously will find their customers expressing their dissatisfaction directly or through social media. Yet this does not have to happen. A range of vendors now offer products that can ease the difficulties of navigating the digital business environment. One of them is Zuora, which has been growing rapidly in providing what it calls relationship business management applications to address needs in subscriber management and recurring revenue. Zuora provides subscriber management, pricing and packaging, billing, payment, quoting, revenue management and analytics on its cloud-based platform. A key distinction of Zuora’s approach is a common foundation for all data related to the demographics, behavior and financial aspects of subscribers’ identity to provide insights about customers and enable interactions across the lines of business. Zuora’s platform and applications can help organizations adapt their business functions, including marketing, sales, customer engagement, operations, finance and even IT, to subscription-based processes. Unlike ERP approaches that are designed around products and invoicing, Zuora’s focuses on the subscriber from engagement to fulfilling services and supports the full range of recurring revenue processes. At Subscribed, its annual customer and industry event, the company introduced Zuora ’17, the latest release of its platform. Its primary aim is to help sales and marketing, product management, finance, IT and business leaders work in a synchronous manner to maximize the potential of subscription-related services. CEO Tien Tzuo addressed the need for a unified approach that is efficient and can drive better results. It provides an alternative to “stove pipe” approaches that isolate front-office functions and finance and accounting processes. Zuora’s latest product roadmap, articulated at Subscribed, describes a series of new products coming to market over the next year. The company plans to come out with incremental improvements on a monthly basis that its customers can take advantage of as part of continuous optimization efforts. In its Zuora community it releases details and collaboration between company and customers occurs. For example, in the April 2016 release, the product is localized for more languages around the world. It supports invoice creation through a template and assists finance groups in foreign currency conversion and processing of exchange rates, as well as tracking and reconciling currency gains and losses. The platform is designed to be integrated with using SOAP API and interface using WSDL. The previous March 2016 enhanced product pricing and bundling through business rules. It also expanded reporting through a drag-and-drop report builder that includes scheduling and interactive slicing of data. The goal is to enable incremental improvements that organizations can take advantage of easily. Last year Zuora identified a need to use analytics to advance the subscriber experience. Its first step was the acquisition of Frontleaf in 2015. Combining their products it created Z-Insights and a collection of modules that use analytics to gain insights on the life cycle of subscribers. Now that has evolved into a metrics-driven approach that aims not just to understand subscribers but to segment subscribers and interact with them in a personalized manner. Z-Insights enables users to see the lifetime value of customers, their level of engagement and the health of the relationship – a unique approach to what we call continuous optimization. This advancement led us to award Zuora our 2015 Technology Innovation Award in Customer Excellence. 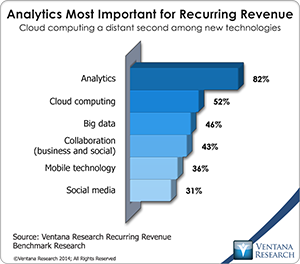 Our research on recurring revenue finds that analytics is the top priority for new technology in 82 percent of organizations. Zuora’s focus on analytics-driven subscription processes can facilitate continuous optimization in recurring revenue. For sales, Zuora can help through its Quotes module and its interface with salesforce.com’s sales force automation (SFA) to manage needs for more configurable products, and its fulfills what many organizations are looking for in configure price quote (CPQ) software. Organizations do not need to use a separate product that has not been well integrated with its SFA or subscription processes. This shift to embed capabilities is evident elsewhere, as Oracle bought and integrated Big Machines and more recently salesforce.com acquired Steelbrick; that can already be done within Zuora for subscription processes. For flexibility in packaging and pricing it can handle a catalog of pricing models, even those that require prepaid addressing, draw-down methods and real-time updates of billing. For finance, Zuora has worked on managing invoices and billing through a subledger that can interface with and post to an organization’s accounting and ERP system. This helps Finance manage subscriptions and general ledger postings as they occur if necessary or in batches for routine updates. Zuora interfaces to ERP systems from providers used by small and midsize business such as Intacct and NetSuite and larger, more complicated ones such as SAP. While CFOs may be willing to examine a dedicated approach to recurring revenue, many are still fixated on manual processing through ERP and miss the point that automation in finance is only a small part of the value of new technology. My colleague Robert Kugel pointed out many of these challenges. The larger value for finance that Zuora provides is immediate access to subscription metrics and analytics to understand how existing business will impact future revenue and in having visibility into subscription processes across the organization. Zuora also has advanced what it calls Data Connect, which integrates the applications and data of its platform to key third-party application areas including payment, ERP and accounting GL, CRM, tax and Web systems for commerce. It also provides event-based notifications and interfaces to make it easy to adapt to the platform from other environments. Such integration points are essential for subscription processes across business, and Zuora will have to continue to invest in connecting to a growing number of critical systems, at some point also supporting third-party integration systems. 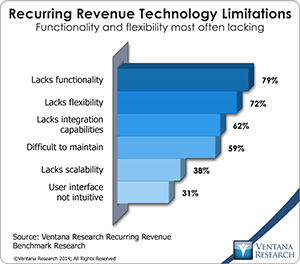 Zuora is addressing a key limitation often found in recurring revenue: lack of integration, which our research finds is an issue for almost two-thirds (62%) of organizations. Last year Zuora launched RBM Connect Marketplace where extensions are provided as applications by Zuora and its customers. These partner applications include capabilities to process sales taxes and provide invoice notifications. Partners including Xactly can help organizations pay incentives on subscription-based revenue. Zuora also has been expanding its Zuora University to expeditiously train customers and partners on its platform and products. This sort of facility is becoming increasingly important, as is certification to ensure quality of deployment and use of its applications. Zuora has three key editions of its software, called Growth, Enterprise and Nine, to meet the diverse needs of companies by industry and size. Zuora has scaled its platform to ensure it can meet the largest deployments and has been validated by major companies using it, including Ford, IBM, Schneider Electric and Symantec. At the conference it presented what it calls BRISM (build run insane mode), which can handle any burst requirements for billing that happen to customers on its platform. It also supports the range of security for customer and financial information and complies with PCI, SOC, ISO, HIPAA, FIPS and other methods. In addition control of the platform is accomplished through roles and permissions, along with audit trails. The newest announcement is support for multiple-entity deployment in its Nine edition, which will help organizations that want a common approach to managing separate divisions of subscriber operations in diverse deployments. The Subscribed conference presented customer validation on the diversity of what is possible with Zuora. Gerber Technology offers product life cycle management to large clothing providers including Levi’s, Nike and REI and more than 17,000 customers in 130 countries. The Seattle Times newspaper is transitioning its print and digital services to a fully automated subscription approach using Zuora. Another customer, Surf Air, has introduced on-demand membership to its fleet of airplanes flying in California. Overall Zuora is blazing new ground to expand the possibilities of subscription processes and recurring revenue applications in cloud computing. In the end organizations need to expand their engagement with new and existing customers and ensure that the experience is seamless. Our research finds that customer engagement throughout the life cycle (55%) and cross-selling and up-selling (46%) are top challenges for organizations using these models. Zuora is focused on helping organizations in any industry succeed with recurring revenue and maximize subscription-focused efforts. Organizations that are interested in the value of using a dedicated approach to managing and optimizing subscriptions to engage customers and optimize financial results should check out Zuora. 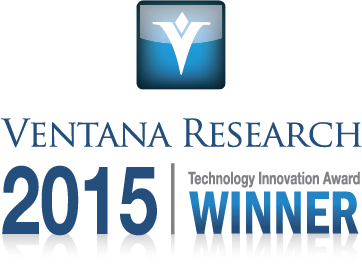 Ventana Research is the most authoritative and respected market research and advisory services firm focused on both business and technology. Since our beginning, our goal has been to provide insight and expert guidance on mainstream and disruptive technologies. In short, we want to help you become smarter and find the most relevant technology for your organization.